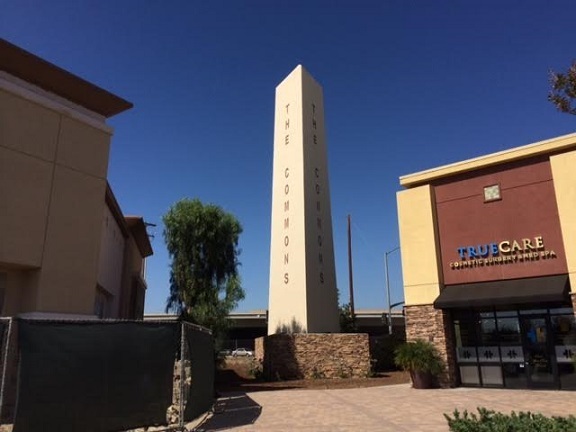 In Chino Hills, there’s now a 63-foot cell phone tower disguised as a Washington Monument-style marker. It’s at The Commons, a shopping center by the 71 Freeway. That burst of silliness leads off my Friday column, followed by news items from Ontario and a Culture Corner. Karen Bristow was never elected to office, but she served in various capacities in Chino Hills going back to 1969 to make the community a better place. Now she’s moving away. My Sunday column pays tribute. Sunday’s column presents a clutch of items from Chino Hills, starting with the amusing fate of its former Civic Center. There’s also three Valley Vignettes, from La Verne, Upland and Claremont. Friday’s column is about my annual-ish visit to a Chino Hills City Council meeting, this one with two items of interest: short-term rentals (maternity hotels, Airbnb) and business signs that could, potentially, not be in English. Friday’s column starts with an item about the Chino Hills woman who is representing California in the Miss USA pageant. She’s a Latina who was asked recently about Donald Trump’s anti-immigrant remarks. After that, I’ve got news items from Chino, some cultural notes and a followup item on the Ontario monsignor who died. I wouldn’t have thought I’d be writing a second item about “True Blood,” a TV series I’ve never watched, but around the same time they were filming a few scenes in Pomona, which I wrote about, they were asking permission to film in Chino Hills. Sunday’s column explains what happened to that. Also, the recent Padua Avenue sign news in Claremont reminded me of a similarly odd sign near the same location; and I present a few vignettes. 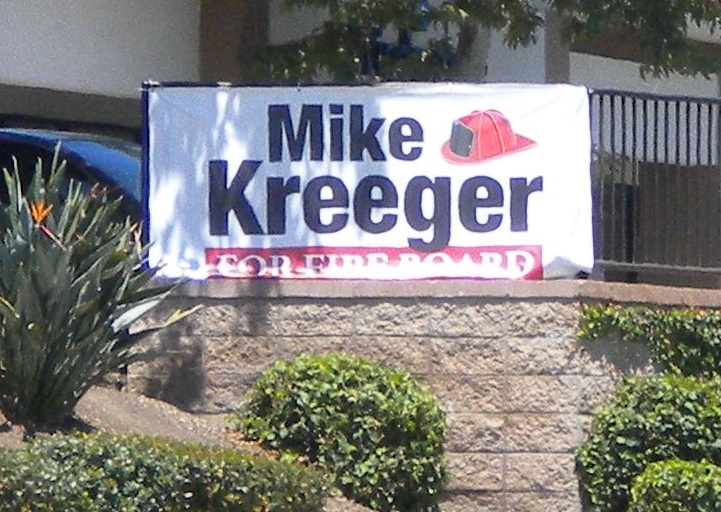 A sign for a candidate running in the Fire District election Tuesday made me do a double-take. The candidate’s name was unfamiliar, and yet in other ways very familiar. So let me break it down for you. Mike Kreeger is not to be confused with Mike Fleager, who is the city manager, or with Bill Kruger, a former councilman. You’re welcome! 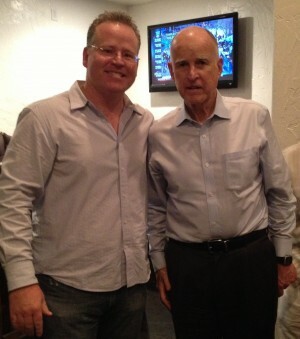 Jerry Brown with Bob Guidry, owner of Las Cascadas. Unbeknownst to most of us (even the Chino Champion didn’t print a word about it until Saturday), Gov. Jerry Brown stopped off in Chino Hills for dinner one Friday night six weeks ago. The quirky story can be found in Sunday’s column. Friday’s column recounts the highlights, and middle lights, and maybe even one or two lowlights, of Tuesday’s Chino Hills council meeting. Wednesday’s column (read it here) begins with an item about a new Best Buy in Chino that the retailer seems to think is in Chino Hills. What’s funny is that this began as a one-line item about the new store, which I learned about from my Sunday advertising circular. But once I set out to determine the store’s location, things got more interesting, as you’ll see. Following that are various items from around the valley and a plug for the Pomona Public Library’s Adopt-a-Magazine effort.